…raising interest rates prematurely would have been exactly the wrong thing to do. In the weak (but recovering) economy of the past few years, all indications are that the equilibrium real interest rate has been exceptionally low, probably negative. A premature increase in interest rates engineered by the Fed would therefore have likely led after a short time to an economic slowdown and, consequently, lower returns on capital investments. Correct. Raising rates too soon would have inevitably led to lower rates for the longer term. And his points on Fed policy reflecting market rates are well taken. But he then makes the case that the Fed is helpless to raise the market-clearing rate because of excess savings by other countries. He ignores critiques that perhaps Fed policy is too tight. It’s hard to imagine rates at their current low levels if, say, the Fed publicly declared as its goal 4% inflation or higher for the next three years. Current low rates are a result of the deliberate Fed policy to shoot for 2% inflation or lower. Markets don’t expect more than 2% inflation, so how could they expect interest rates to go much higher? How can we expect returns on investment to shoot up if nominal GDP is stuck between 3%-4% growth per year? 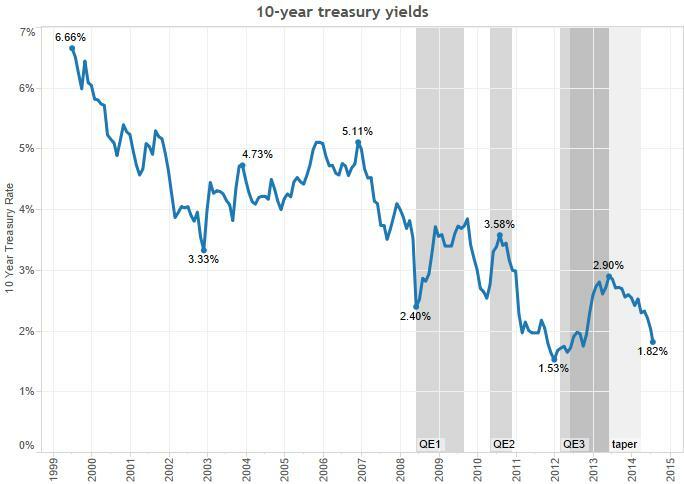 Case in point, below are treasury yields since 1999. The shaded areas represent QE. Notice how when the Fed printed money (raising inflation expectations), 10-year yields jumped. Crazy, huh? The Fed actually could get us to a point where interest rates of 5% are normal, and where borrowers and lenders would happily meet at the implied debt prices. But that would take a serious adjustment to Fed policy. Either lots more QE, or some explicit commitment by the Fed to higher inflation / higher NGDP growth. Now the Fed is stuck at targeting 2%-or-lower inflation. And since we all believe the Fed would tighten a lot sooner than it would loosen (because rates just aren’t “normal”), we’ll continue to be stuck with ultra-low interest rates.